John Marshal Kincheloe teaches high school social studies at Stamford Central School. He’s the drummer for the popular regional band, Blues Maneuver. All John’s family is musical. His daughter, Arleigh, and son, Jackson, will appear at the Mountain Jam Music Festival this June at Bethel Woods, site of the original Woodstock. Their band, Sister Sparrow and the Dirty Birds, with a national reputation and following, will perform the festivals’ first evening. Governor Cuomo released his FY2018-19 Executive Budget proposal & accompanying legislation. This signals the start of state budget negotiations. Though the Governor proposed an additional 3% in education funding in this year’s budget, he CUT STATE LIBRARY AID by 4%. Our libraries are critical to the state’s educational infrastructure. We need YOU to TAKE ACTION NOW and write to your elected officials that State Library Aid must be treated fairly in this year’s final budget – State Library Aid MUST increase in proportion to any increase in overall education funding. TAKE ACTION NOW! With less than 30 seconds of your time, you can send a letter to your elected officials and legislative leaders. Without your voice, library funding faces a 4% CUT in this year’s budget. The proposed funding is $4M less than what was in last year’s enacted state budget. This proposed CUT fails to acknowledge the crucial role libraries serve in our communities, and the contributions they make to our state’s education system. Libraries ARE Education! State Education Law requires that Library Aid should be $102.6M for FY2018-19. Libraries should be fully funded under the law. Absent of that, library aid must at least increase each year in parity with increases in education funding. As you know, the State Library Construction Aid program received a $10M increase in last year’s enacted budget. Governor Cuomo has proposed eliminating that additional funding. The State Division of Library Development estimates that library renovation and construction needs are $1.7B statewide. Over 48% of public libraries in NYS are 60+ years old, and an additional 33% are 30+ years old. Investment in the Library Construction Aid program must be increased to address aging infrastructure, energy inefficient buildings and the evolving ways people use libraries. NOW is the time for YOU to SPEAK UP and let your legislators know that state library aid MUST be treated fairly and equitably in this year’s state budget! As always, NYLA is relying on everyone to take action, and contact your elected officials through NYLA’s online advocacy tools, encourage your colleagues and patrons to participate in these actions. Encourage everyone to “Get on the List” NYLA has developed, and visit nyla.org/advocacy for updates. When engaging with your elected officials, it is important that you discuss the great work you and your library are doing, and to also stay on message by using the talking points we have on our website. For those of you on social media, we have posted a set of tweets that we encourage you to use, and tweet at your local Assemblyman and Senator. LIBRARY ADVOCACY DAY is Wednesday, February 28, 2018! Come to Albany and make your voice heard! Sometime around 1894, summer resident Mrs. Alexander Skene first proposed the idea of the creation of a Library for Griffin Corners. (As known physician Dr. Alexander Skene had a summer home east of Griffin Corners, and enjoyed their time in the Catskills immensely. It took several years, but plans progressed, and a Board for a Library Association (one type of Library then quite popular in New York State–not municipally -President. Other prominent citizens such as DeWitt Griffin, Mrs. T. C. Banker, and Mrs. George H. Lasher were on the board. Plans progressed slowly. 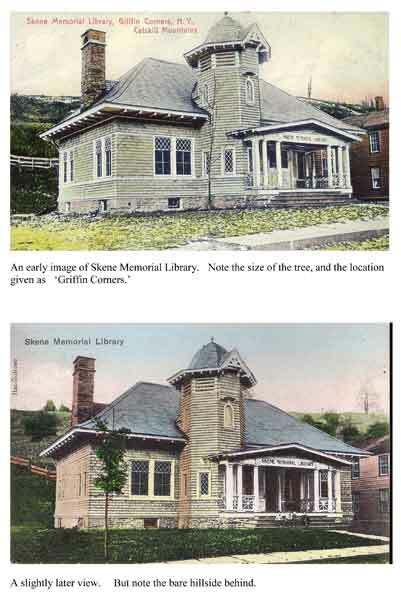 The cornerstone for the building was laid in November 1901, and Griffin Corners finally had its library. Skene Memorial Library is unusual for it is one of the few area libraries built AS a library. 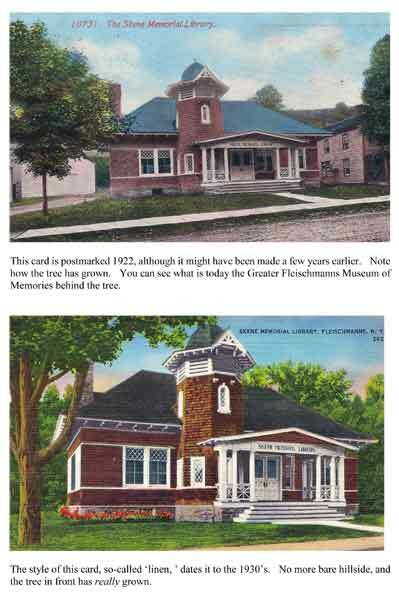 As people and conditions changed, the Association Library structure no longer was working here, and in 1930 the building was turned over to the Village of Fleischmanns, and Skene became a Municipal Library. In 2001, in honor of its centennial, Skene Library was placed on both the New York State and the National Register of Historic Places. A special Postal Cancellation was held to observe the centennial.